I can finally put into words one of the reasons why I’m addicted to cookbooks. I seem to imagine that the world of cooking is one big puzzle, and each time I learn something new, another piece is fit into place. And, I quite enjoy adding more and more pieces to that puzzle. I have an example. Last summer, I was cooking from Eric Ripert’s A Return to Cooking , and I attempted to make pique which is a spicy, Puerto Rican condiment. It didn’t work out so well, and I searched and asked around for more information about it and came up with nothing. Then, a couple of weeks ago, I was sent a review copy of Daisy: Morning, Noon, and Night , and while reading that book, I found a recipe for vinagre or vinagre de piña which was very similar to that for pique. I then learned that they are indeed the same thing. Seven months later, that piece of the puzzle was set into place. The process for making vinagre or pique was slightly different in this book, and it worked great this time. This new book is by Daisy Martinez from the Food Network’s Viva Daisy. I’ve never seen the show, so I wasn’t familiar with her cooking style. The book is a collection of her family’s favorite dishes experienced while traveling through different Spanish-speaking regions of the world. It’s an interesting culinary tour with lots of tips for advance preparation and piecing together menus. As the title implies, there are dishes for every meal in the day as well as food for parties and snacks. Bold flavors are found throughout from the shrimp ceviche xni pec to chimichurri sauce, Spanish coca which is like pizza, and Peruvian yellow pepper puree. There are desserts too like guava shells filled with cream cheese mousse, banana and dulce de leche strudel, and strawberry delicia. So, when I finally figured out that pique goes by another name, I had to try it again. 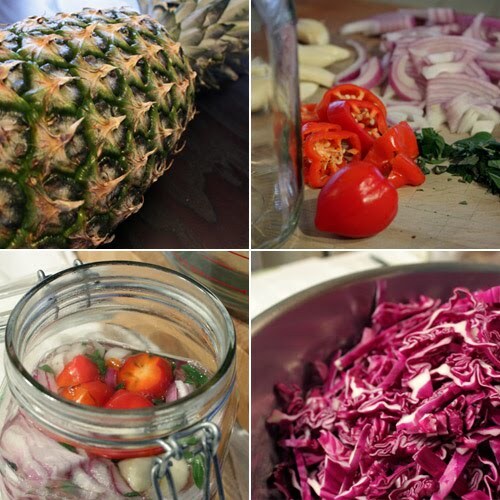 In this version, pineapple rinds were boiled for 30 minutes, and the liquid was then strained and added to a jar with sliced onion, smashed garlic cloves, habanero chiles, cider vinegar, fresh oregano leaves, black peppercorns, and some salt. It was left to cool and then refrigerated. In the previous version I tried, the mixture was left to ferment at room temperature, and it transformed into a questionable brew. This time, the hot liquid got the flavors mixing right away, and by going right into the refrigerator once cool, nothing bad had a chance to happen. The onion and garlic gave the acidic mixture big flavor, and the habaneros gave it a good kick. I used the vinagre in Daisy’s boricua slaw. The slaw was suggested as a side dish for anything served at a barbeque. It’s a crunchy mix of red cabbage, carrots, cider vinegar, cilantro, scallions, and vinagre to taste. I was so thrilled with the flavor of the vinagre, I continued to sprinkle more and more on the slaw at the table. The cabbage can definitely stand up to a good amount of spiciness. Since the slaw was mentioned as a side dish for meats, I also wanted to try the turkey breast pavochon from the book. The name for this turkey dish is a mix of pavo meaning turkey and lechon which is roasted suckling pig. In this case, the turkey is roasted and seasoned in the same way as a lechon is prepared in Puerto Rico. 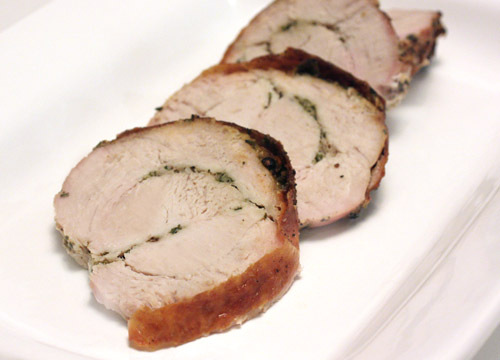 A double, boneless turkey breast was seasoned with a wet adobo rub made from garlic, salt, black peppercorns, dried oregano, olive oil, and white vinegar. 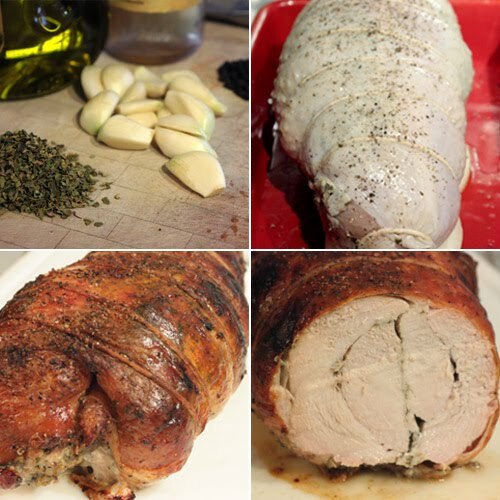 The adobo rub was placed under the skin and on the back side of the double breast, and then the meat was rolled and tied into a compact roast. I left it to marinate in the refrigerator overnight. The next day, I roasted the turkey first at 400 degrees F for 45 minutes, and then at 375 degrees F for an additional hour or so. The roasting time depends on the size of the turkey breast, so it’s important to start checking the internal temperature after about an hour and 15 minutes. The internal temperature should reach at least 150 degrees F before removing the turkey from the oven, covering it with foil, and letting it rest for 20 minutes. I can tell you that this turkey smelled so good as it roasted that I may never cook another bird without some adobo sauce on it. The skin browned nicely, the meat was delicious and tender, and Kurt nodded with definite approval declaring it very good turkey. I had a lot of fun perusing this book and trying a few of the Latin-inspired dishes, and I look forward to trying more. Next time, I’ll tell you about how the turkey leftovers were used. Wow,how unique! Looks just delicious and beautiful too. Nice job Lisa! Gorgeous meal Lisa, such a perfect post to end the hectic week. I love the slaw such a bright color from the cabbage. Mmmm... Nicely done with the turkey, too. Definitely looks cooked to perfection. Now, I'm drooling! That meal is wonderful and not too heavy! What a colourful dish. Looks great. Love that roasted look on the turkey. wow-this is gorgeous! daisy used to have a pbs cooking show (you can still catch it sometimes), then she was snatched up and food network-ified. she still makes some great looking dishes, though, as evidenced by you! beautiful post and pics. Waw,...a georgous & fabulous looking meal, Lisa!!! This is a stunning meal! first of all, banana and dulce de leche strudel? be still my dessert-loving heart! now, on to the matter at hand--this bird is unique and completely enticing, and the slaw ain't too shabby either! It is so enjoyable to read your posts! I get to learn a lot! I have absolutely no idea what the Puerto Rican cuisine is about and am so appreciative of their way to use things like "pineapple rind" . Wow! That adobo sounds great too. Seriously stunning. And thanks to you I now know what pavochon means! You're on the random blogs on the Foodie Blogroll! Awesome blog! Like Grace said - Banana and dulce de leche strudel! Oh please try that one next and share! I used to cook turkey breast a lot, but since moving to Europe have seemed forget how much I love it. Must remember to look for some next time I'm at the butchers to try this out. 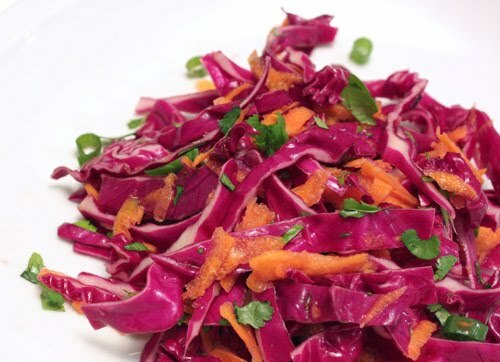 Red cabbage is so delicious in slaw, and the color looks amazing too. Daisy Martinez is fabulous! I love her PBS show - she has such a passion for food! And I love reading about your snapping in another piece of the culinary puzzle! Love your blog! An excellent meal! The turkey breast looks so delicious and I love the colorful slaw! I've been seeing positive reviews of Daisy Morning Noon and Night of recent. The success of the pique and turkey certainly speak to the quality of the recipes. They look great! That Turkey just looks totally delicious. I do love turkey but I find it gets dry real quickly but this looks like a lovely piece of meat.